I've taken some time out from my taxidermy assemblage art over the last 18 months or so to get back to painting. In art you need to go where your inspiration takes you, and the act of painting oil on board I find cathartic. My work is mainly inspired by nature and the Proustian concept of involuntary memory. With this in mind I've gone back my childhood, with 'Wombling free' the first painting in the gallery below. As a kid growing up, it was hard not to fall for the charms of The Wombles on TV, and as with some of my other work I've included a Golly which, while perhaps controversial now, were such a huge part of many children's lives in the 1970s. This painting is 105cm x 122cm oil on board. Next in the gallery below is 'Dogon and the flamingo' - 139cm x 86cm oil on board. I’ve always collected tribal art figures and the Dogon is something I've featured before - they were hand carved by African tribes two centuries ago to represent fertility. The flamingo is a bird often associated with Africa, and they are a creature I'm fascinated with - they way they look and they way they move. Truly one of nature's wonders. Last in this trilogy is 'Fang and the Christian saint', which again is influenced by Proust's mantra 'in search of lost time', and features the ancestral Nommo inspired motif from the African Dogon Tribe. Oil on board 139cm x 86cm. I've been looking back at my late father Ian Broomfield's oil paintings recently (see gallery below). He was a huge influence on me, not just as a parent but as a talented artist. At the core of my own oil on board paintings and my taxidermy assemblage art, is Proust and his mantra that objects trigger memories. 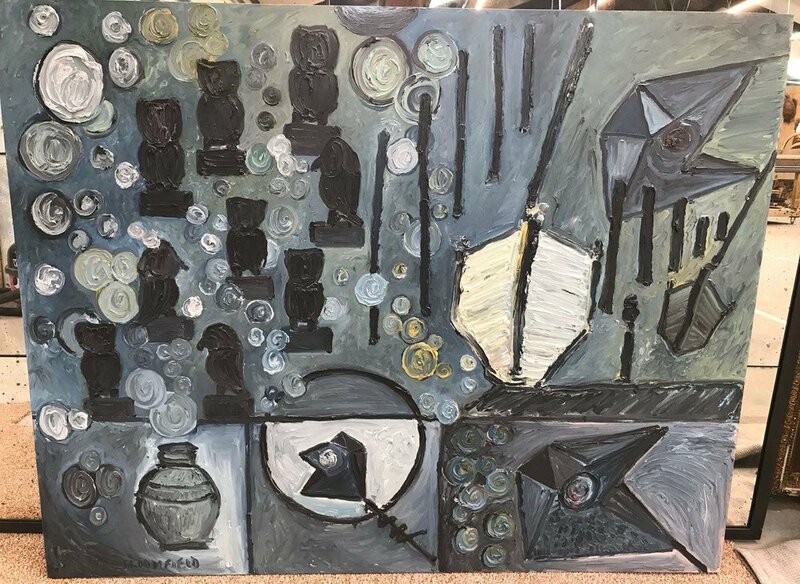 I have vivid memories of my father painting at home - and so my father's paintings not only directly influenced my work, seeing his art caused me to remember his funeral. I stood with my mum Jennifer and sister Laura at the water's edge near our home in Emsworth, Hampshire. It's an idyllic spot by the harbour, and we had envisaged dad's ashes being gently blown out to sea on a breeze. What actually happened was, when I turned over the urn they fell out at my feet in a lump - which I had to nudge with my foot, only for it to land in the water with a resounding 'plop'! Each of us stood there, stifling laughter, not really knowing how to act. But then my dad always had a wry sense of humour and I think he would have laughed out loud! The words in the title of this Blog "you just start to get it, then you die..." are what my dad said to me three hours before he passed away. It seems a fitting tribute to remember his words here. So, the first of my dad Ian's paintings (below) was done in the 1970s at Emsworth Harbour where his ashes were 'scattered'. I love it. The next painting in the gallery is one I created recently 'The Cremation of Ian Broomfield, in memory of my father'. Owls are symbolic in death and a link to the passing down of knowledge, the boats and groynes are my interpretation of dad's painting and his urn is bottom left. We have recently had a short break, visiting family in France. While there I spotted this stunning work of art on a house in Argenton-sur-Creuse. I felt the flamingos were reminiscent of my own oil on board painting 'The Dance' which is one of seven pieces I have on show at Broomhill Art & Sculpture Gardens here in North Devon until the end of July (click here for more). It looks stunning, and I love the fact that someone had the conviction to paint it on their house - and that it overlooked the most beautiful river. On the opposite river bank there is a big cathedral, it's spire dominating the skyline. Proust mentions church spires in his novel 'In search of lost time', which is a major influence on my work. I spent many years living and working in France and feel really at home there. Many of the vintage objects I use in my assemblage and taxidermy boxes were collected at markets there. Broomhill Art Hotel, just outside Barnstaple in North Devon, is now hosting an exhibition of seven of my new oil on board paintings. They will be on show until the end of July 2018. I'm grateful to this fabulous venue for their continued support for my art. I have previously had a successful exhibition of my taxidermy assemblage boxes there, and been guest speaker for the North Devon Arts group in their gallery. If you haven't checked it out yet, or perhaps not been for a while, Broomhill is home to the National Sculpture Prize, the stunning sculpture gardens and the award-winning restaurant Terra Madre. You can find out more about the paintings on display in my recent blog 'Figures, Flamingos & Fish'. Many thanks to Bianca Robinson for the exhibition photos in the slideshow below. My work has always been predominantly inspired by nature but I also frequently make reference to the Proustian concept of involuntary memory. I’ve always been fascinated by and collected tribal art figures. Depicted in these paintings are fertility figures from the late 19th and early 20th Centuries from the Dogon, Fang Gabon, Sepic River and Baoulé tribes. Carved by hand with very basic tools over a century ago or more, I feel that they conjure memories for me of their makers, their owners and keepers throughout their history. Often carved to represent the souls and spirits of the dead, those souls, travel forward through time touching those in whose possession they are. Several pieces from my collections have seemed to follow me. Perhaps I had missed buying them at one point only for them to turn up again at a later date at a different auction or fair. Perhaps they were made by people that were associated with me in a past life and trigger a memory and a feeling of connection to and previous knowledge of those objects. The vintage 60s/70s Gollies, whilst controversial to some, simply trigger the recollection of the safety and comfort of childhood - safe in the sanctuary created for me by my parents. I have a slight obsession with flamingos - the way they move - they remind me of the curvaceousness of the female form and yet are phallic too in the shape of their necks and heads. For me they represent love and fertility and so sit well alongside the tribal fertility figures. 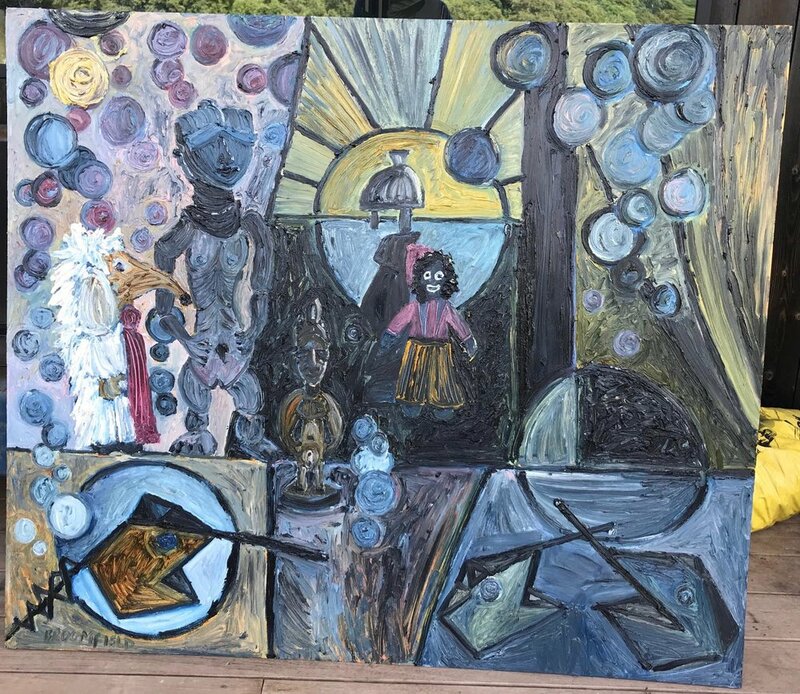 The fish in the paintings are frozen - my message in these depictions is that we’re destroying what feeds and sustains us along with the native cultures who revered, respected and lived with nature rather than plundering it for their own financial gain. This body of work will be on display at Broomhill Art Hotel in North Devon from April 1st 2018 to the end of July. The international children's charity, Arms Around The Child, have expressed their profound gratitude to all the artists, committee members, press and collectors who supported the Art Around The Child, 'Home is where the Heart is' art auction at the Fiat Chrysler Motor Village in London this month. £50,000 was raised from the silent and online auction, and the live auction with Hugh Edmeades, Christie's International Director of Auctioneering. Curator Lee Sharrock worked closely with charity global director Ellie George Milner and partnered with Monica Colussi to make it a huge success. The money will help start building a home for 50 HIV+ orphans in Jaipur, India who the charity has supported and developed for the past 10 years. I was honoured to become a member of the event committee last year, and I travelled to Jaipur to meet the kids and help them create their own art that was included in the auction - you can read more about that trip earlier on my blog. I also donated some of my taxidermy assemblage art pieces to the auction. A charity spokesman said; "We urgently need to build the home as we have been given notice to quit our current rented home due to stigma around HIV/AIDS and pressure from the neighbours. We have had to move the children 4 times due to similar circumstances. The Rajasthan Government have donated the land and we need to fund the building." "Additionally we work in Ghana with orphan children rescued from slavery and trafficking and in South Africa with children who are exposed to HIV/AIDS through abuse and children who live in child headed households. So a big thank you to everyone who made the exhibition and auction possible, your support means we can start to lay the foundations for the new home in Jaipur & fund our ongoing work in India and Africa." You can see a full list of the artists involved on the image below. I've taken a step back from my taxidermy art for a little while to indulge my passion for painting. There's something very cathartic about working with oil on board, primal even. The first work shown below is 'Dogon and the flamingo' (139cm x 86cm), and is inspired by the carvings of the African tribe the Dogon - incredible art which is now highly collectible. The ancestral Nommo figure is a running motif in many of these tribal carvings. 'Via con dias' (139cm x 86cm) reflects on the special time I spend in the ocean - I love kayaking, fishing, surfing and wandering the shoreline looking for flotsam and jetsam to use in my taxidermy and assemblage boxes. See below for this painting. 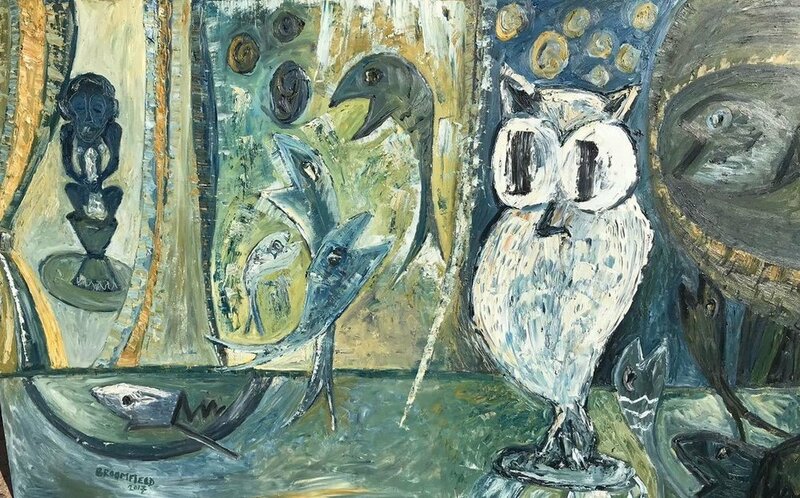 The last two in this series are both titled 'Owl and the blue monkey' (139cm x 86cm). Proust's concept of 'the search for lost time' and linking memories to objects is the main driving force behind all of my art. In the painting below I'm examining where the natural world and spirit world cross over. Online bidding is open now for the 'Home is Where the Heart is' auction, raising money to fund the work of children’s charity Arms Around the Child, to build a home for HIV+ orphans in Jaipur, India. You can see the all of the works created and donated in an exhibition at Fiat Chrysler Motor Village, Marylebone, London from November 9th - 16th with opening hours of 9am to 5pm, and you can bid online by clicking here. Curated by Lee Sharrock in association with Monica Colussi, 'Home is Where the Heart is' includes artwork by Sir Peter Blake, The House of Fairy Tales, Gavin Turk, David Byrne, Pure Evil, Hassan Hajjai, Nancy Fouts, Hannah Matthews, Jimmy Galvin and many more artists including myself. Art created by some of the orphans in India will also go under the hammer, and you can read more here about my trip to Jaipur last year to help them with their paintings as a committee member of the Art Around the Child initiative. The auction itself will be held at an invitation-only evening on Thursday November 16th from 7pm at the Motor Village with former Christie’s International Director of Auctioneering Hugh Edmeades chairing it. During the live and silent auction drinks will be provided compliments of Bering Ice Vodka, McGuigan Wines and Pistonhead. Fiat Chrysler Motor Village Marylebone is located at 105 Wigmore Street, W1U 1QY. For more about the exhibition and auction go to armsaroundthechild.org/art-around-child-art-auction. The latest artists have been announced who are supporting the 'Art Around the Child' auction on November 16th. It takes place at the Fiat Chrysler Motor Village UK in Wigmore Street, London. Art created by children in India and Africa will go under the hammer, alongside work donated by an array of leading artists, to raise funds for the Arms Around the Child - a charity helping to build a home and create new opportunities for HIV+ orphans in Jaipur, India. Rómulo Celdrán develops his work within the fields of drawing, painting and sculpture. He had his first solo exhibition at the age of 16. His early introduction into the professional artistic world led him to consolidate his artistic training in a self-taught way. His curriculum vitae includes solo exhibitions like Rómulo Celdrán at Hasted Kraeutler Gallery in New York in 2014, Macro in 2013 at Arthobler Gallery, Zurich (Switzerland) or Zoom at Raquel Ponce Gallery in Madrid in 2010; group exhibitions at an international level featuring his participation in Sketchy at Hasted Kraeutler Gallery in New York in 2013, the ONCE Foundation IV Contemporary Art Biennial at the Conde Duque Cultural Centre in Madrid in 2012. 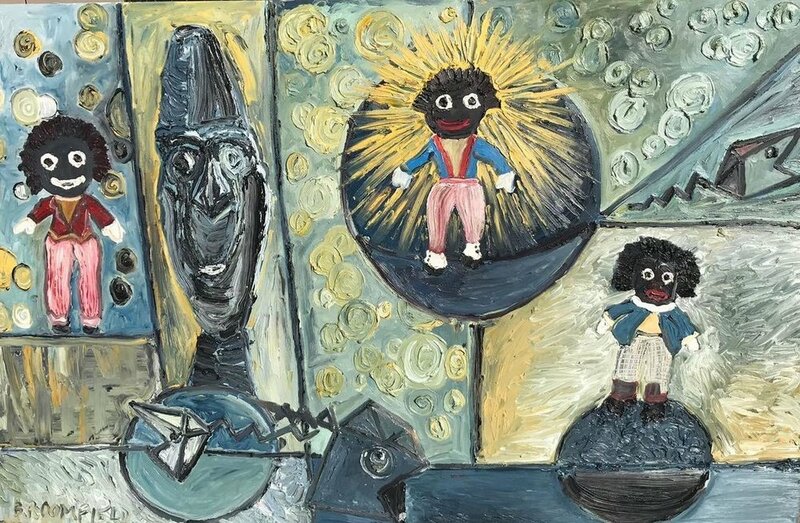 His work can be found in private and institutional collections around the world. With an undeniable passion for the art of photography, world renowned artist and video director Mike Ruiz creates vibrant, ultra stylized work that stands out from the crowd. Collaborating with the best of the best, he works with an impressive list of clients including beauty and fashion brands like L'Oreal, Shick, Dark, Lovely and Garnier along with a host of A-list celebrities including Prince, Betty White, Katy Perry, and Nicki Minaj to name a few. Art Around the Child: November 16th, a selection of artworks to raise funds for the Arms Around the Child - a charity helping to build a home for HIV+ orphans in Jaipur, India. In the late 1990’s Toni graduated from Brunel University. After a stint training as an Ice Carver, Gallagher decided she needed a slightly warmer career path. Toni came in from the cold and spent the next few years as an Art Director in commercials. In November 2012 she held her first solo Art Exhibition, “The Gluttonous Lady Who Swallowed a Fly” to much critical acclaim. Currently she is exhibiting in Venice in a group show titled Fall Of The Rebel Angels II. Much of Gallagher’s work is inspired by the fragility of life and centres around perception, identification and interpretation of the sensory information surrounding us. 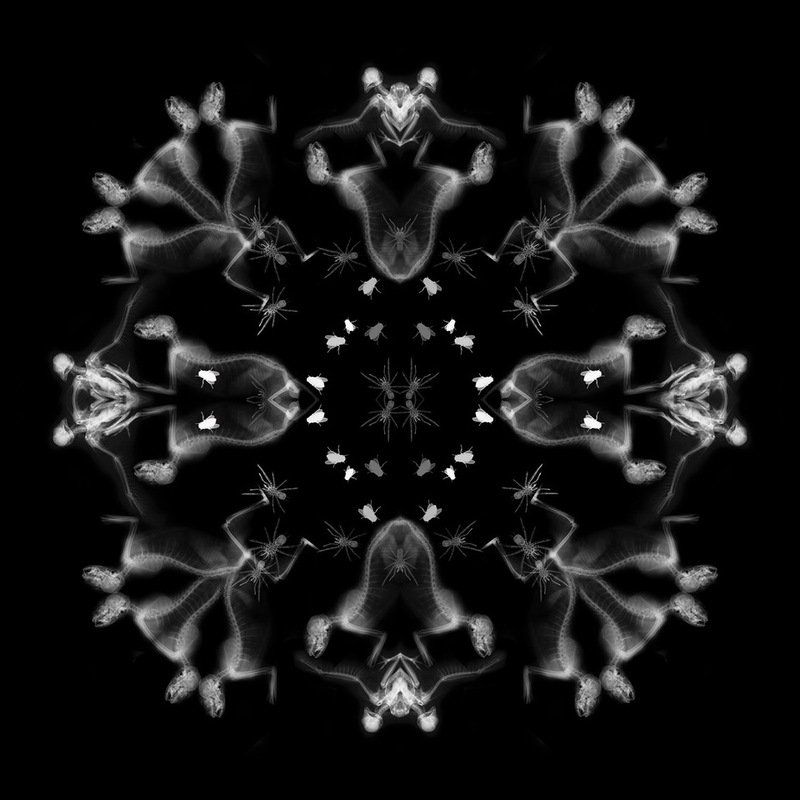 Her work focuses on symmetry, usually associated with positive characteristics such as good health, beauty and balance, interwoven with a macabre beauty. Rebecca Mason is a UK based artist using light to convey the darkness within human life, existence and emotion. Her work is an extraordinary mix of truth and beauty through which she is able to engage her audience with brutal observations about life, love, money and culture with her honest, and often humorous, interpretation of the modern world. mistakes, feelings and from the events of the wider world and politics. Her work focuses on day to day human existence. It encompasses themes of inequality, fear, misinformation, disinformation, imperfection, prejudice, blame, judgment, assumptions, truth, acceptance, power, control, chaos and wilful oblivion. I've taken a bit of time off from the Blog to concentrate on work, but I'm back with an important 'save the date' - November 16th 2017 for the 'art around the child auction' in London, fundraising to help build a home for HIV+ orphans in Jaipur, India. It is a project that I'm humbled to be involved with - the money raised will help transform the lives of many disadvantaged children. You can read more about our trip out to India to work with the kids last year here on my Blog. Check back for regular updates as we get nearer the big night. Massive thanks goes out to curators Lee Sharrock with Monica Colussi, and Ellie Milner from the charity Arms Around the Child, for bringing together what promises to be an amazing event, with the power to change lives. I have a new project underway to create two significant sculptures. I'm indebted to my friend and talented filmmaker Mikey Corker who is going to document the process. I have an exhibition of some of my recent taxidermy assemblage art at Bray Leino in Filleigh, Devon (EX32 0RX). The show is set up in ‘The Roost’ for the next two months or so. Please view by appointment by calling Scott Franklin on 01598 760700. The Bray Leino company is one of the shining beacons of cutting-edge creative work being exported from here in rural North Devon, and I'm delighted that they're displaying my art. At the end of this year a major exhibition and auction will be taking place, featuring art created by a group of HIV+ orphans in Jaipur, India. 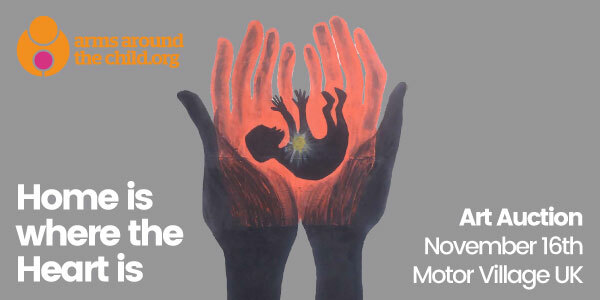 It is being organised by the internationally acclaimed charity Arms Around The Child. 'Art Around the Child' is a project that I'm humbled to be involved with - the money raised will help transform the lives of disadvantaged children. You can find out more about this amazing initiative in the official press release from the charity below. You can read about our trip out to India to work with the kids last year here on my Blog. Check back for regular updates throughout 2017. This assemblage piece is simply called 'Swan'. Placed upon the prow or stern of a boat, the nautical figurehead of the swan was used to represent grace and mobility on the water - particularly in northern Europe. The swan was a favourite figurehead by the 13th Century, and sailors also believed that the swan was the most fortunate bird in omens. The piece comprises an 18th Century Carved Wooden fragment, redecorated using silver leaf and earth pigment washes, a vintage sailing boat, 19th Century handmade bone Die, an early 20th Century Swan's egg, a late 19th Century pearlescent hat pin and early 20th Century Nautical maps along with a Vintage Sherry Glass & perfume bottle. The handmade glazed wooden box measures 340mm wide x 500mm high x 190mm deep. A major influence on my assemblage art are Marcel Proust's writings about involuntary memories and senses being triggered by objects. This piece 'Jonah Hawk' represents the loss of a loved one and the journey of their soul. The bird standing on the movements of vintage pocket watches is a direct reference to Proust's seminal work 'In search of lost time'. The handmade glazed wooden case measures 500mm wide x 670mm high x 210mm deep. Hello and happy new year! 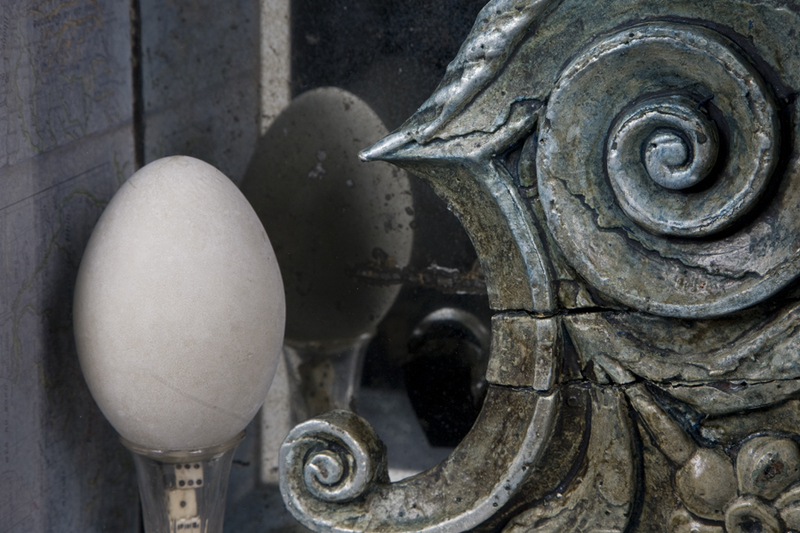 I'm kicking off 2017 with news from internationally renowned artist and friend Nancy Fouts who has an exciting new collaborative exhibition coming up in London. Thanks supporting my art in 2016! Happy New Year from me, and my merry band of helpers here in North Devon! 2016 has been such an incredible year, with two London exhibitions and giving a talk about my work to the North Devon Arts group to mention a few - take a browse through my Blog to find out more about what I've been up to. Of the many highlights was our inspirational trip to India with the international charity Arms Around the Child, to create art that will become the focus of a major fundraising initiative next year. Have a wonderful 2017, and thank you to everyone who has supported my art in so many ways in 2016. I love working with nature, and it never ceases to amaze me on so many levels. 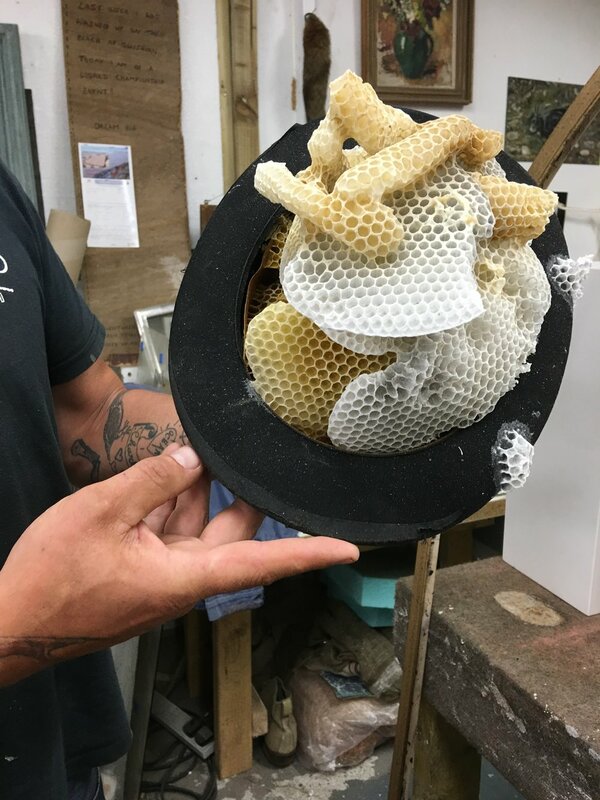 My friend Simon Swallow is a keen beekeeper here in North Devon, so we tried a little experiment. 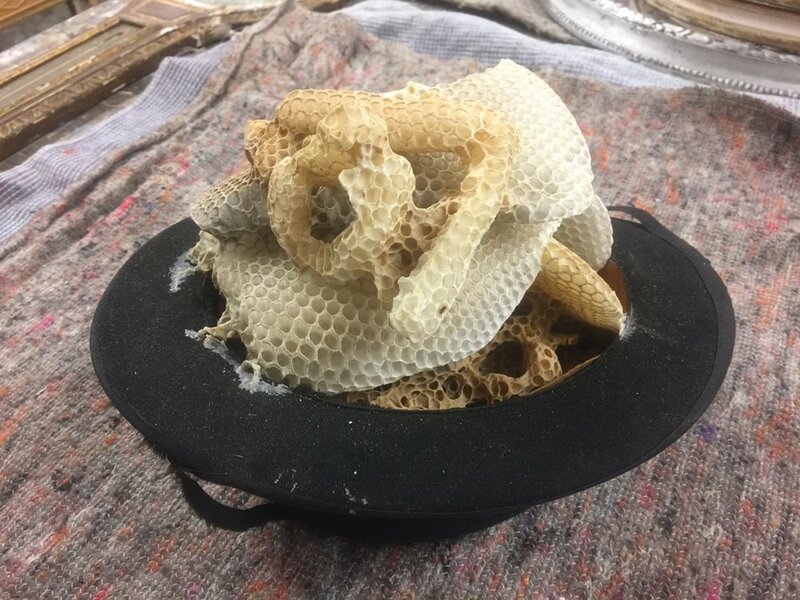 We took a small piece of fresh honeycomb, placed it in a vintage bowler hat and put it back in the hive. 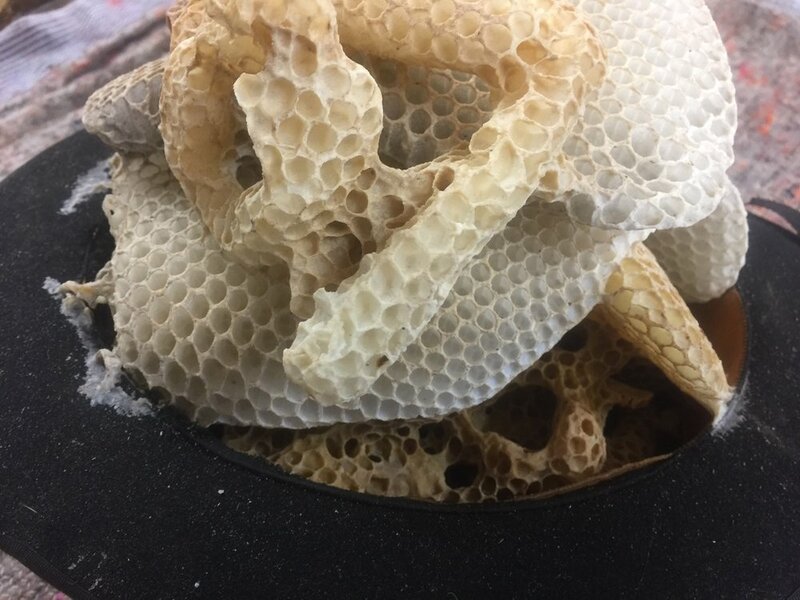 A week later we came back and found that the bees had created their own stunning natural art! You can see the results in the gallery below. I plan to use this in a new piece of taxidermy and assemblage art, and also look at future 'collaborations' with these wonderful little creatures! Bees play an essential part in our ecosystem, and along with many other species are being threatened by human actions. We're doing our bit here in rural Devon to encourage bees to flourish, and we urge you to do the same.